Gradient Adventure offers a wide range of exciting adventure activities, outdoor skills courses and guided mountain walks in Snowdonia and Scotland. Based near the outdoor Mecca of Llanberis in North Wales, most of our activities take place in the mountains of Snowdonia and the rugged coastline of Anglesey and the Lyn Peninsula. All activities can be tailored to suit a wide range of abilities and ages. Our aim is to provide a high quality outdoor adventure experience in a safe, relaxed and fun way. All staff are fully qualified and experienced outdoor instructors and live locally so know the area well. As well as memorable days out, Gradient Adventure can also provide bespoke coaching, allowing you to safely enjoy your own mountain, river, canyoning or coastal exploits. Based in Snowdonia, North Wales, Gradient Adventure is a small company run by Glyn Calland. Originally from South Yorkshire, Glyn started his outdoor life as a teenager exploring the moors and crags of the Peak District. At 16 he joined Castle Mountaineering Club allowing exploration further afield. Glyn currently holds the Mountain Instructor Award (the highest summer qualification for the UK) Winter Mountain Leader, and also a BCU (British Canoe Union) Level 3 white water coach. Glyn also has a Sport Science degree and PGCE in Outdoor Education. As well as climbing and kayaking Glyn enjoys windsurfing and has done so across Europe and Australia, instructing in Greece for a season. Glyn is also a keen paraglider pilot. When not running courses for Gradient Adventure, Glyn works for the Joint Service Mountain Training Centre. Glyn will always try to run Gradient Adventure courses personally. In the event of this not being possible Glyn will use other suitably qualified and experienced instructors. Snowdonia is a mecca for mountain walking. It offers majestic rocky summits to gentler more rounded peaks to sedate and beautiful valley walks. A potentially more relaxed water activity, canoeing is a great way to see the myriad of lakes and waterways that Snowdonia has to offer. 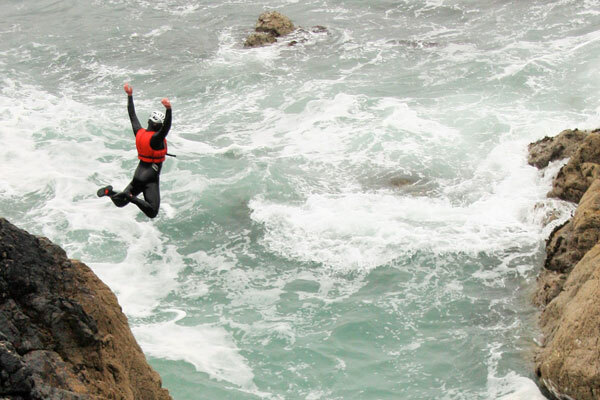 Coasteering is a very popular way of exploring the rugged coast of Anglesey. It involves scrambling around the base of sea cliffs, lots of jumping in, lots of swimming and even exploring caves and narrow inlets. Our Snowdonia canyoning courses offers a range of real canyoning experiences in a variety of exciting canyons to suit everyone's taste. Read how to book, download booking forms, terms and conditions! 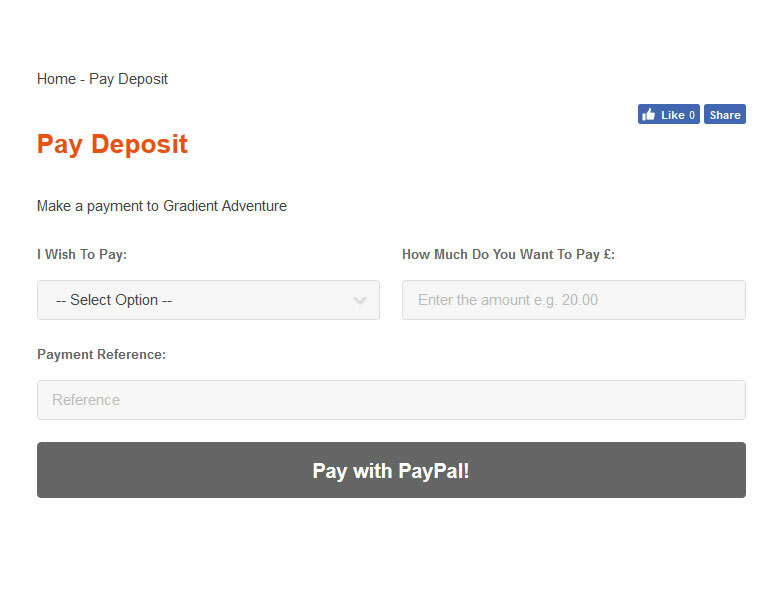 Make a payment to Gradient Adventure for your course.